The Mercure Rimini Artis is a modern, stylish 4-star hotel in a privileged location in the heart of the Adriatic Riviera, directly on Rimini's seafront promenade, one of Europe's most famous beaches, surrounded by fantastic opportunities for shopping, fine dining and fun. It boasts 57 rooms with terrace with sea view, American Bar open 24 hours a day, outdoor heated pool with hot tub corner available all year round, fitness center, meeting room and large underground parking garage with controlled access. Sun, sea, big events and much more. In Rimini, there's something for everyone: big theme parks, a rich historical hinterland, food and wine routes, the new Palacongressi conference center and the trade and exhibition district. 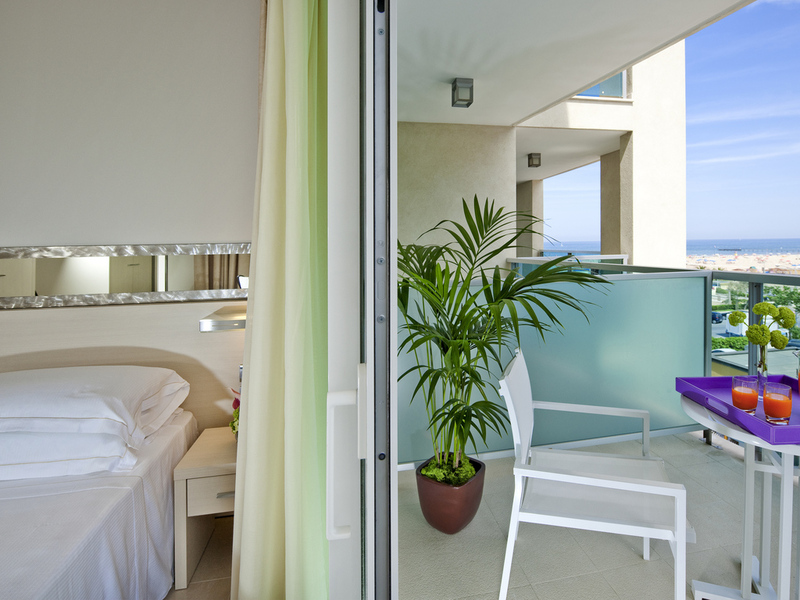 Bright, spacious rooms, each with a balcony with direct or indirect sea views. Comfortably equipped, soundproofed, air-conditioned, electronic card access. Twin, double, triple and quadruple rooms available. Welcome to the elegant and exclusive lobby bar, boasting simple, minimalist furnishings and huge windows overlooking the stunning outdoor pool. Why not relax and sample one of our barman's impressive creations? Had a one night stay recently and was impressed with the quality of hotel and the staff. Very welcoming and friendly on arrival. Really pleased with room that had a partial sea view on side of hotel. Breakfast was reasonable. Nice touch with free pizza pieces and snacks on the bar in the evening. Great location. Would definitely stay again. We had a really lovely time. The gentleman at the reception who's name I think is Nikola, was very welcoming and checked us in. He gave us a lovely room when my husband told him we were celebrating my birthday. He was very helpful and recommended a nice restaurant for our dinner. The room we stayed in was nice and clean with a lovely sea view. The hotel looks and feels quite new even though we were told it is about 10 years old. The room we were given was bright and spacious with two balconies, one looking to the street and the other with a partial sea view. The staff at reception, bar and breakfast restaurant were very friendly and helpful. The happy hour was a nice surprise with wine and snacks. The breakfast was sumptuous with made-to-order eggs and other nice touches. The only complain we had was that the balcony double glass doors in the room could not close 100% resulting in street noise creeping in. But that was a minor problem as we slept quite well in the large, firm double bed. The hotel was so good we decided to stay there for another night. All in all a very good experience. I didn’t stay there and you charged my credit card. I’ve tried to reach your hotel on many occasions along with emails. I selected your hotel based on FALSE ADVERTISING that the hotel was near Rome. I’ve complained about this to my card. You should refund my payment. Good water pressure, very nice people. Free bike rental. Less than one minutes to beach. The hotel is clean and cozy, and the staffs are very friendly. Location is also good. Nice hotel in a great location, Great people. We enjoyed our 1 week stay at Mercure Rimini Artis. All the staff at this hotel (from Reception (Nicole and other gentleman with beard), bar& Breakfast (Mia and Christina) and cleaning) were very friendly and nice. We had a warm welcome and good treatment during our whole stay. rooms were very clean & tidy and very well maintained. The swimming pool was great with warm water 24/7. Few things to be improved are 1. sewage smell from shower drain, 2. fresh fruits in the breakfast area to be covered to avoid flies. Apart from these issues it was brilliant. We definitely would recommend to our friends and we will stay if travel to Rimini again. We had a wonderful stay. The room was fantastic, the staff amazing and the free breakfast comprehensive and delicious. We would highly recommend this hotel. Great service from friendlyb and helpful staff, excellent breakfast. We stayed for the second time at Artis. Everything was outstanding as we expected it based on our first stay. Personnel is friendly and helpful. Rooms are very good. Parking in the private garage. Absolutely recommend this hotel to everybody. Extremely pleasant and courteous Staff, with a can Do attitude. The room was clean and efficient Bed was very comfortable and relaxing. Lovely hotel .Room very nice and clean housekeeping was excellent.Bar Staff was also excellent as well. Reception could not of been more helpful from the moment we walk in until the moment we booked out. Would not hesitate to stay again. The true hearted friendliness of the staff, at reception, at the bar, at the breakfast service and the house keeping is really amazing and makes one feel very well taken care of.